A design system is not a pattern library, brand guidelines or a Sketch file. A system of living principles, guides and components used by designers and developers to build consistent products and experiences. A design system is a product. It has users, roadmaps, releases, features, maintenance, bugs, documentation and support. 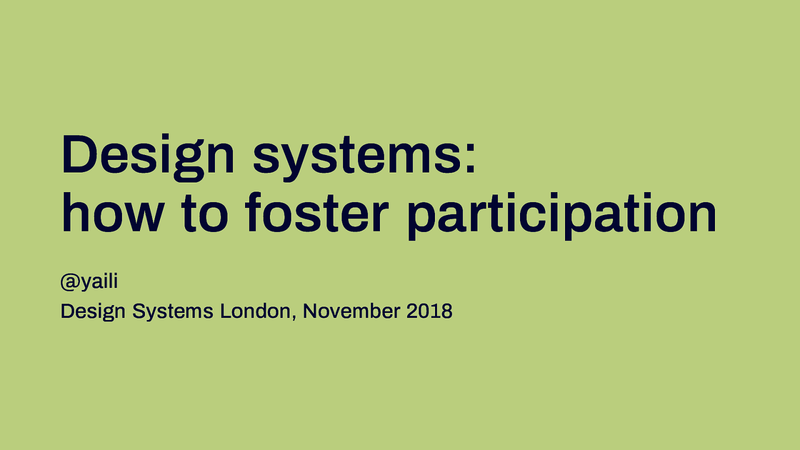 View Design systems: how to foster participation on Notist. All the resources mentioned in the presentation, and photo credits. Want your #DesignSystem to be used and adopted ? `Be sure to allow ways for everyone to participate. Some people are not very vocal but still has stuff to add: async participation for example.` - (Free style quote of @yaili's words in Design Systems London'18. Too much to quote, just watch the video of the talk! Great job putting together this talk! I wish I was there to chat with you about my experiences and yours. Next time! ”If users don't like what you created for them, they’re gonna to reject it. And that’s how design systems die. 3. Listen to the quiet ones. 4. Be ready to accept help. 5. Share work in progress.